John Willcock College students have settled into the new school year with ease through a series of Sub School orientation days. Each year all six John Willcock College Sub Schools take a day out of the classroom and devote the time to team building, problem-solving and agenda setting activities. This year most of the Sub Schools utilised the facilities at Sun City Christian Centre for a day of activities including logic problems games, building newspaper towers and indoor soccer. All of the activities are designed to foster a sense of team identity and working for a shared goal. Chapman Sub School Leader, Jo Crothers said the students had an amazing day and many were begging to have every school day there. 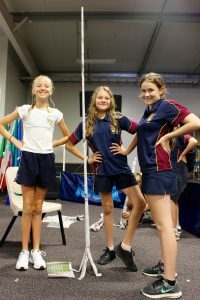 “The Chapman staff were very impressed with the team work and support the students gave each other and the Sun City staff were impressed with how well mannered and respectful the students were during their time at the Centre,” Ms Crothers said.